The British Virgin Islands consist of the main islands of Tortola, Virgin Gorda, Anegada and Jost Van Dyke, along with over fifty other smaller islands and cays. Only 15 of the islands are inhabited. They were first settled by the Arawak from South America around 100 BC, and the Arawak inhabited the islands until the 15th century when they were all but destroyed by the more aggressive Caribs' tribe. On his second voyage to the Americas in 1493, Christopher Columbus spotted these beautiful islands and named them "Santa Ursula y las Once Mil Vírgenes" (Saint Ursula and her 11,000 Virgins). Later shortened to Las Vírgenes (The Virgins), the Spanish Empire claimed the islands in the early 16th century, but never actually settled them. Similarly to the now established U.S. Virgin Islands, these islands (over time) were also captured and controlled by many European powers, including the Danes, Dutch, English, French and Spanish. In 1648, the Dutch established a permanent settlement on the island of Tortola. Seeing an opportunity, the stronger English navy captured Tortola from the Dutch in 1672, and then annexed Anegada and Virgin Gorda in 1680. During this same period of time, while continually trying to expand its influence into the Caribbean, the Danish West India Company built settlements on nearby Saint Thomas, then on Saint John in 1694; Denmark later purchased Saint Croix from France in 1733. The British, as in their other colonies in the Caribbean area, introduced sugar cane, which quickly became the main crop and source of foreign trade. And of course, slaves were brought from Africa to work the plantations. Until the middle of the 19th century, the local economy continued to boom, but then across the Caribbean the abolition of slavery took hold and "free labor" all but disappeared. Adding to the misery, some horrific hurricanes continually devastated the islands, sugar cane production was drastically reduced, and these once prosperous islands now suffered from economic decline. During World War I, the United States, worried that the Germans could possibly use the islands as a submarine base, purchased Saint Thomas, Saint John, Saint Croix from Denmark for $25 million, renaming them the U.S. Virgin Islands. Britain retained control of these islands, and since the mid-1960s, they've moved away from the long-established agriculture-based economy towards financial services and tourism, and what a successful move has been. As a modern offshore financial center (like the British controlled Cayman Islands), the British Virgin Islands now enjoy one of the more prosperous economies in the Caribbean. 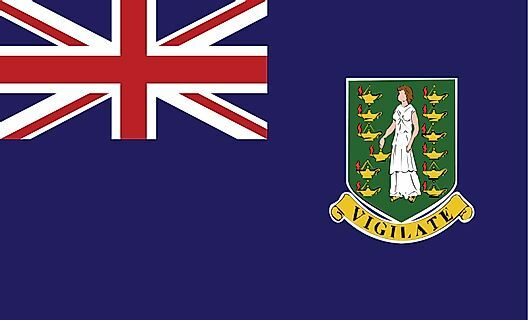 Today the British Virgin Islands remain under the control of the British Government, but are administered by a hands-on Governor appointed by the Queen of England. Steeped in the history of the British Navy, the islands are ringed by shipwrecks; the most famous of these - The RMS Rhone - is now a national marine park, and a favorite scuba diving point. Road Town, the capital city, is crammed with markets, boutiques and restaurants, and remains a favorite stop for cruise ship passengers. Ferry service to the outer islands is convenient and economical, but outer island air service is limited. Where is British Virgin Islands? What is the Capital of British Virgin Islands? Where Is Virgin Gorda Island?